Valentine’s Day is for lovers — of preserved buildings. After years of studying the issue, culminating in months of intense civic debate, the Evanston City Council basically threw up its hands in December and voted to halt the process to demolish the building, located at 2603 Sheridan Road. 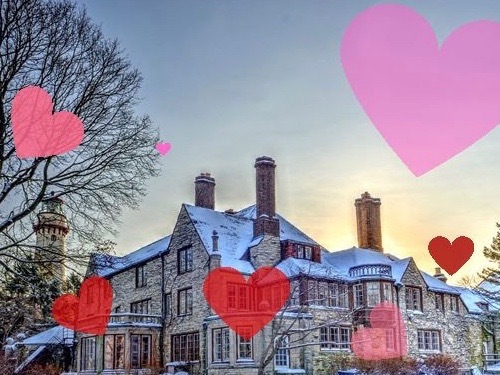 The event begins at 10 a.m. Saturday at Backlot Coffee, 2006 Central St., where attendees will make heart-shaped tokens of esteem for the Harley Clark Mansion, built in 1927 by architect Richard Powers, with a surrounding garden designed by Jens Jensen, the landscape architect who’d already built Chicago’s Garfield Park Conservatory. At 12:30 p.m., they’ll move over to the mansion to display their works. Public outcry and an overwhelming vote in a November referendum against demolition of the building, which served as home of the Evanston Arts Center for 50 years ending in 2015, also backed by Evanston’s own Preservation Commission, which ruled against demolition, resulted in the mansion being “mothballed” until some other use of the building is determined. Assistant City Manager Erika Storlie said in December that the city regularly fields offers to put the mansion to use, and just last month best-selling writer Audrey Niffenegger, author of “The Time Traveler’s Wife” and an Evanston native, came forward with a proposal to convert it into a book and paper center, complete with an offer to back it with $500,000. Landmarks Illinois also played a role in saving Harley Clarke, threatening to file suit if the Evanston City Council overruled its own Preservation Commission and moved to raze the building. It was no idle threat, as the statewide preservationist nonprofit just this week joined in a suit to save the old Rock Island County Courthouse. This weekend, however, will not be devoted to litigation, but to love for a cherished local landmark. Consider yourselves invited.